Another area Jeff explores is coaching. He illustrates how once you reach a level of expertise your rate of improvement slows as you compare your past self with your present self. Jeff argues that you must leverage a coach or mentor to change your perspective and facilitate improving your skills. Stop comparing you with you, and start benchmarking yourself against a pro. Benchmark with what’s possible, then build a daily route to advance forward. 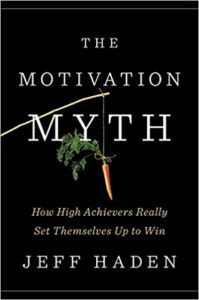 The Bottom Line: Jeff is a talented writer with great arguments and recommendations for demystifying the motivation myth. The book is an easy read with direct correlations to personal and business life. Leveraging Jeff’s recommendations will concentrate your energy, broaden your awareness, and result in a higher level of performance. I recommend buying this book as the first step in triggering your motivation cycle. Roundtable Rating: Recommended for ambitious leaders looking to enhance personal and organizational motivation in pursuit of a better tomorrow.